In the splendid setting of Palazzo Pitti, from 18 October to 4 November, visitors can enjoy offerings from leading wine estates, plus various gastronomic, cultural and fashion events in which tradition and innovation come together to produce some truly unique and superlative items. 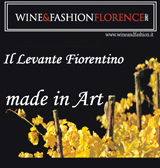 Wine & Fashion Florence is back for the seventh consecutive year, this time in Palazzo Pitti’s exclusive Teatro del Rondò di Bacco. Every day tourists and locals alike can sample the flavours of the Levante Fiorentino and admire the flair and creativity of Italian producers. Fashion, food and wine, and the beautiful artefacts of this area of Tuscany will be the real stars of the event, which bring together top Italian wine estates and fashion designers and the local municipalities of the self-styled Levante Fiorentino, namely the area comprising the Valdarno, Valdisieve and Bagno a Ripoli<, plus the Comunità Montana Montagna Fiorentina. All the parties involved are working together to develop and enhance the area’s international profile in relation to the strategic markets of Germany, Japan and the USA. The happy combination of history and tradition lies at the heart of AR3, the exhibition organized and promoted by the Florence branch of the National Confederation of Craft Industries, the goal being to highlight the quality of work produced by local craftspeople. Visitors can admire the art of Antonio De Vito, the Florentine mosaics of Mauro Tacconi and the works in scagliola of the Bianco Bianchi workshop. Many high-profile players in the world of fashion, wine and high technology are also lending their support to Wine&FashionFlorence, including Polimoda and Intel Italia.